I have a confession to make. Two and a half years ago, I began cheating on yoga. For a long time I kept this a secret. Maybe because I believed that my daily asana practice was all I needed to keep me healthy and inspired. But even so, one day I found myself much less “fit” than I wanted to be. For years I had faithfully stepped on my mat and practiced. Diligently. Vigorously. I practiced on days that I wanted to, and days that I didn't want to. I practiced with my hypermobility and instability, which no amount of handstands or turbo dogs seemed to help. I think the tipping point came the day I realized that I couldn’t chase down an errant ball my daughter was playing with without gasping for breath. So upon the advice of one of my students, I started working out at a local CrossFit box. The day I dusted off my sneakers and signed up for 12 one-on-one sessions with a coach at CrossFit Impervious changed not only my yoga practice but my life. That first day was brutal and humbling: I could barely run around the block. Or row for 200 meters. Or lift a barbell. Or do a pull-up. But it was also exhilarating and life-affirming, and I stuck with it. Now, two and a half years later, not only can I chase a ball without getting winded, I can do a pull-up (100 of them, actually), climb a rope, and deadlift more than my body weight. I have come to realize that, for me, CrossFit was the missing link. 1. No amount of planks or chaturangas will stabilize my hypermobile joints. I am one of those very bendy people who can put their foot behind their head without warming up. My elbows and knees are “double-jointed.” As a kid I would straighten my arms for the shock value. “Eww!” my friends would say at the sight of my arms folding back on themselves. And while this makes certain poses easily accessible, after more than two decades of asana, I started to feel pain in my shoulders, elbows, knees, and hips from all the deep backbends and hip openers I was doing. The Olympic weightlifting moves and gymnastic training we do at CrossFit strengthened the stabilizing muscles around my joints, making my body stronger and more intelligent. I now understand that mobility requires both strength and flexibility. I get this from doing both yoga and CrossFit. 2. CrossFit brings me out of my comfort zone. 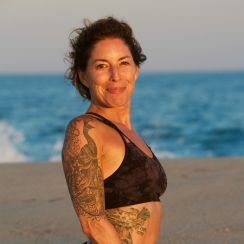 Author and journalist Gail Sheehy said that “Growth demands a temporary surrender of security.” Let me tell you, CrossFit feels like traveling to a different country without being able to speak the language—at least for a yogi like me—and that is a good thing. The greatest growth often happens when we venture into the uncomfortable or unknown. It is there where we get out of automatic and debunk the myth that what we habitually do is who we really are. I have spent over two decades discrediting that myth on my yoga mat, and that is something to celebrate. But my mat is starting to feel really comfortable, and in many ways I am starting to plateau in my practice. CrossFit gives me a new way to continue to grow. 3. I get to practice yoga off the mat. I had to learn to stop thinking and start feeling all over again—to take my yoga practice off the mat. I’ve been repeating this to myself for over a decade. This is the essence of Forrest Yoga, the style of yoga I practice and teach—to feel deeply. I have become quite skilled at this on my yoga mat. Yet, here in the new and uncomfortable world of CrossFit, I couldn't for the life of me get out of my own way. I had to learn to stop thinking and start feeling all over again—to take my yoga practice off the mat. 4. I get to practice giving up control. I learned this lesson while competing in the CrossFit Open. This is a yearly event where people from all over the world “compete” against one another over the course of five weeks. During one of the workouts, we were required to do “squat cleans” with progressive weights much heavier than I had ever lifted. The workout went like this: We had four minutes to complete 25 hanging knee raises, 50 single jump ropes, and 15 squat cleans (starting at 55 lbs). Squat cleans are my nemesis. They require lifting the barbell from the floor, and then—just as it reaches your hips—using your pelvis and thighs to thrust the bar upward, and then “catching” the weight in a deep squat. If we completed it in time, we would move on to round two and add 20 pounds to the cleans, while decreasing the reps by two. This went on until we either failed to do a round in four minutes or the clock reached 20 minutes. “I’m screwed,” I told my friend Shannon, who was also competing. “We both are,” she said. But I showed up for the workout anyway, knee socks pulled high to protect my shins from collateral damage. My coach told me not to worry. “You’ve got four minutes,” he said dryly. “Plenty of time.” And it was—for the first round. By the time I got to the squat cleans in the second round, I had three minutes left to complete 13 cleans at 75 pounds. While this may not seem like a lot of weight to some people, it was for me. I did all right for the first couple, but then I got spooked. Each time I lifted the bar to my hips, I found myself too frightened to get under the bar and catch it in a squat. It was tiring me out. So I did. Barely. Fighting for every rep. The clock ran out with three reps left. I never made it to the next round. “One hundred seventy-five reps,” my coach announced when it was over. And that is when it hit me. The lessons I learned in yoga and CrossFit about control and letting go are life lessons. The way I lift is the way I live my life. I will never master that weight if I don’t learn to let go of trying to control it. Yoga and CrossFit taught me the same lesson. I have to learn to meet it halfway. 5. I’ve learned that success takes many shapes and forms. So I got to work. I did pull-ups with a big rubber band. Over time I was able to substitute a smaller band. After that, I did jumping pull-ups off a box to build my strength where it was lacking and to increase my focus. I would routinely beat myself up for not getting it fast enough. My coach repeatedly told me that with practice I would get it. And despite the fact that I had been saying this same thing to my yoga students for years, it wasn't until I was hanging from a bar that it hit me: Success takes many shapes and forms. All I can do is to show up the best way I can, bravely and courageously pick up that barbell or get back onto the pull-up bar or my yoga mat, and keep practicing. Success means progress and not perfection. It happens when I listen to my coaches who encourage me to do one more pull-up, or to crank that rower faster and pull harder. And each time I stop mid-lift or mid-stride to catch my breath, all that is required for me to succeed is to continue to practice. Each time I do, it is a measurable moment of success. That is the heart of my yoga practice, but it took CrossFit for me to learn how to apply this philosophy to myself. So here it is, two and a half years later. I am stronger. Wiser in my body. Out of pain, and finally able to apply the lessons I have been sharing with my yoga students, all these years, to myself. In retrospect, I now realize that I wasn’t cheating on yoga. I was investing in me.